The first time I came across this book was on an eCommerce site when it appeared on my search for pre-order. I ordered the book without a second thought. Usually before ordering a new book I read the blurb or the summary; however, I didn't do that either for this book because it was a Khaled Hosseini book I was buying, and his books have never disappointed me before. So when I got my copy of the book, Sea Prayer, I was little surprised. The book is not like his previous books in terms of length and volume. However, it has all the emotions of a Khaled Hosseini-school-of-storytelling. Few years back, in 2015, an image of a little boy, fully clothed, lying face-down on the shores of the Mediterranean Sea made global headlines. That little boy, Aylan Kurdi, and his family were Syrian refugees trying to reach Europe amid the European refugee crisis. The little boy didn’t make it. The image of the boy become a representation of the plight and sorrow of refugees around the world. The incident affected Khaled Hosseini so much, that, what came out of it is his latest book, Sea Prayer. In this book, the author brings to the fore, in a subtle and restrained manner, the predicament of parents in such a miserable and tumultuous world. Like all his previous books — which are emotional narratives of people displaced from homes because of war and riots — this book too cries out for the life and safety of refugees fleeing from their own motherland in search of a new life. The book is written in form of a letter from a father to his son, Marwan, on the eve of their journey towards a new hope, as they are set to embark on a new life leaving behind their homes and everything they have called their own. Leaving home is never easy. And it’s tough when you know you have a big sea in front of you which you will have to cross to reach a safer place. However, staying back in your own country, which is now turned into a battlefield, is not an option either. They must abandon it for life. And father laments the fact that Marwan might not remember the happy moments at Homs as he was too small then. The only image of Homs his son will carry his entire life is that of war, bombing, bloodshed and gore. Every child deserves a safe and healthy upbringing. But what can a father do when his country, in the current situation, can only promise burials, starvation, and bombings? Even though the future looks bleak — unsure if they will ever be made to feel welcomed at the new place, unsure if they will ever make it to the other end — the father can never lose hope because he has with him the most “precious cargo” (his son), and hopes they will make it to the other end, and God will steer them to a safe place. Note: If you want to help the refugees like Kurdi's, who have been displaced from their homes because of war, buy a original copy of this book. 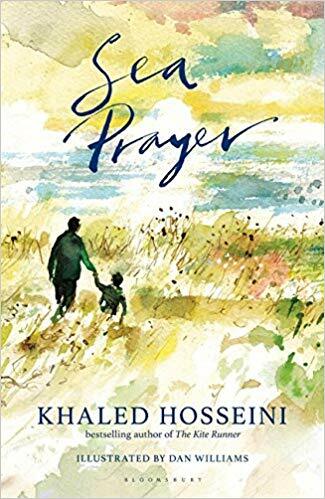 The author will donate author proceeds from this book to the UNHCR (the UN Refugee Agency) and The Khaled Hosseini Foundation to help fund lifesaving relief efforts to help refugees around the globe.